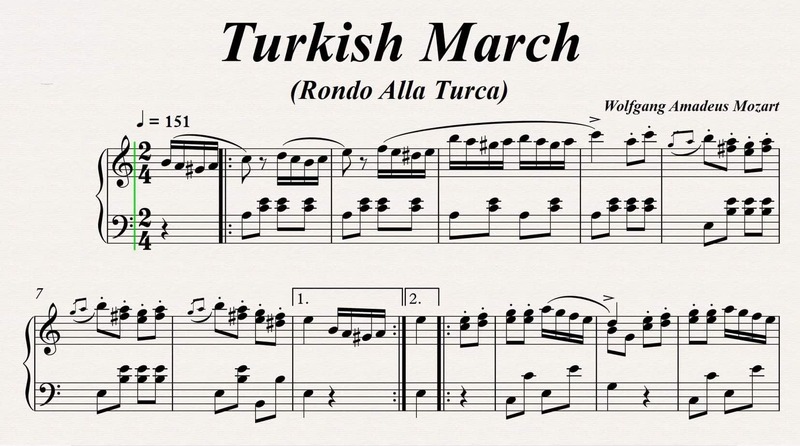 What business did Western Classical Music Composers have imitating Turkish military music? I have always been keen to know where and which musical pieces in the Ottoman repertoire have been assimilated by the Western classical musicians. Well, yes there are some very obvious examples, like the major one being W.A. Mozart and his Piano Sonata No.11 in A major, K.331/300, III. Alla Turca (1783). In the 18th century, Europe was very much taken by The Turkish (Alla Turca) style. It has been a great influence on the Western classical music of the 18th and 19th centuries. The Europeans were mostly impressed by the Music Bands of the Janissaries (mehter). The military bands of the janissaries were called mehter, which literally means “pre-eminence”, “harmonica player”, “tentmaker,” or “kavas”. Ottoman influence on southeastern Europe was massive in both military and cultural areas. Humans are preeminently a plagiarizing species, borrowing cultural artefacts where appropriate. Yes, the Yeniceri Mehter bands are the prototype for Western military bands, which still use many of the same cadences of the Turkish original. Characteristic of Janissary music is its use of a great variety of drums and bells and the combination of bass drum, triangle, and cymbals. Janissary music probably appeared in Europe for the first time in 1720, when it was adopted by the army of the Polish ruler Augustus II. Composer Johann Joseph Fux’s ‘Turcaria’ (K.331) is a six-part piece consisting of ‘Alla turca’ movements named ‘Turcaria-Janitschara’ and ‘Posta Turcica’. Musicians like Haydn, Beethoven have also composed music from the inspiration of mehter. They have reflected their muse inspired by mehter music into their compositions. For example Beethoven has composed “Dervish Chorus” and placed a Marcia alla Turca (Turkish March) in his incidental music “The Ruins of Athens”; and the tenor solo, “Froh, wie Seine Sonnen fliegen” (“Joyful, as Flies the Sun”), from the finale of his Symphony No. 9 in D Minor. Other than these compositions he has used the Alla Turca genre in a wide range in his “Yorck March”, “Wellington’s Victory” or “the battle of Vittoria”(Wellingtons Sieg oder die Schlacht bei Vittoria), Op. 91 pieces. When it comes to Mozart things differ, he not only did get influenced by the genre but he actually based three of these operas directly on Turks or the Ottomans to be exact. He also infused Turkish theme to his L’Oca del Cairo and Cosi Fan Tutte. For example in the first act of Cosi fan tutte, Ferrando and Guglielmo, disguise themselves as Albanians to fool their lovers. As they enter the scene the music played is obviously mused from mehter. Mozart, definitely had a soft heart for the Turks as in his three operas the willingness of the Turks has been clearly laid out in the acts. But the most known of them all are Die Entführung aus dem Serail, Zaide and Le gelosie del Seralio. Especially Singespiel Die Entfuhrung aus dem Serail (1782; The Abduction from the Seraglio) is worldwide known. Mozarts love for the Turks have most probably passed on to his pupil F.X. Süssmayr who himself alone composed operas on Turks and even Iranians. His most famous opera on this topic is the two-act Soliman der Zweite or Die Drei Sulyaninnen. This was later followed by Türke in Neapel (1794), Die Liede im Serail (1799) operas..
Isaac Bickerstaffe’s The Sultan or A Peep into the Seraglio. All these priceless pieces aim to reflect the Turkish culture in European art, as the Turk as ruthless, bloodthirsty, and terrifying; or as exotic, backwards, heretical, and bordering on buffoonery.